We recommend you use Opera, Safari, Firefox or Internet Explorer. This site also works with AOL 5.0 (or newer), because AOL uses IE technology. I have an older browser, is it really supposed to look like this? This site has been tested to work on Internet Explorer 7, Firefox 3.5, Safari 5 and Chrome 7. Every one of these browsers is completely free, so if you are using an older version, upgrading is highly suggested for your own online security. When viewed in older browsers, some features may be "gracefully downgraded" (that's technical talk for "features won't work but we hope you won't notice"). Don't worry, those of you that have been gracefully downgraded, the stuff you lose isn't that important and the site will still work for you. The site was created using HTML, CSS, PHP and MySQL (sometimes managed through PhpMyAdmin). That's it! No frames, no Flash. The site's design allows it to look great and work well with almost any browser. By coding everything by hand, Michael Yingling is able to customize the site according to the club's needs. What's with these colors? Yuk! The current site design was adapted from the original site. In the future the design may be updated. Greg, who wrote the original site, says "I wanted to use colors that reminded me of skiing. So after hours of building experimental prototypes, I decided on the current color scheme. Most of the site is white, with black and blue and purple for the contrasting colors, with red for highlights." You will note that the layout is "liquid", which allows your browser to fill in all of the available space, no matter how large your window is. 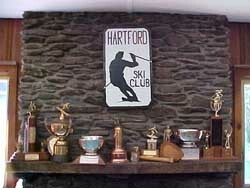 This site was rewritten in November 2010 by Michael Yingling, a life-long Hartford Ski Club member. It is continually being updated today. Photos were furnished by Mark Vining. Thanks Mark!